In a small mixing bowl, combine tomatoes, onion, garlic, cilantro and lime juice. Add jalapenos 2 teaspoons at a time, tasting after each addition to see how hot the salsa has become. Jalapeno peppers vary in heat, so it is important to taste the salsa to ensure you do not make it too hot to handle. Salt to taste. Enjoy! 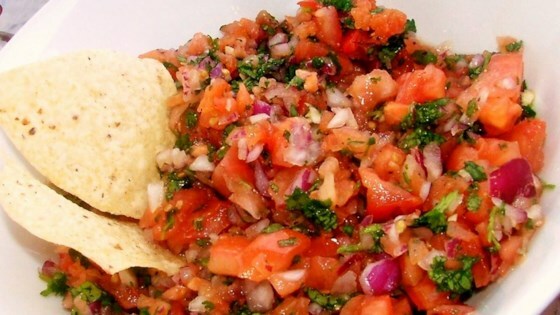 See how to make a simple fresh salsa from scratch. This is quick, easy and delicious! Hint though. After chopping the tomatoes, I drain them in a collander for a while to eliminate some of the excess liquid. This Salsa turned out GREAT!! I did add a fresh green bell pepper from our garden and used 6 tomatoes. I only used a 1/4 cup of cilantro, to make it to my familiys' taste. Thanks for the recipe! Too much cilantro....if I try it again, I will definitely cut back! ICK! Too much cilantro and too much garlic. I ended up throwing it away. Basic idea is good, just reduce cilantro and garlic so it isn't so strong. What a delicious recipie I added an avacado made it just right for us.